Web Desk: Why are people born? Why do they die? Every life has a meaning and the sole meaning of every life is to serve humanity. Terrance Stanley ‘Terry Fox’ was a Canadian athlete, humanitarian and activist of cancer research. In 1977, at the age of 18, he was diagnosed with bone cancer, osteosarcoma and left with one amputated leg. He endured sixteen months of chemotherapy and found the time he spent in the British Columbia Cancer Control Agency facility difficult as he watched fellow cancer patients suffer and die from the disease. Fox ended his treatment with new purpose: he felt he owed his survival to medical advances and wished to live his life in a way that would help others find courage. he set a goal for spending these days. This young man ran across Canada in what he called a ‘Marathon of Hope’ to raise money for cancer research. With the help of an artificial leg, Fox was walking three weeks after the amputation and had raised $1.7 million. 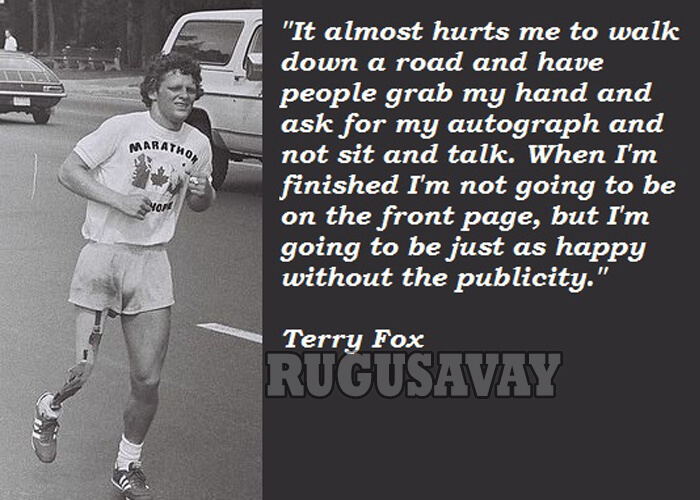 Sadly, Terry’s cancer forced him to finish run. But still he succeeded in his goal of raising awareness of and money for cancer research- a legacy that continues to this day. A week after his run ended, the CTV Television Network organized a nationwide telethon in support of Fox and the Canadian Cancer Society. In June 28, 1981, he fell into a coma and died with his family by his side. This young man inspired the world with his last deed of kindness and became a hero through his courage, hope and determination. He gave meaning to his life and dedicated it for the service of cancer patients. It was his contribution for the world. Everyone should try to become a reason for someone’s love, life and hope before die.